Surface Anatomy. - In looking into the mouth, one sees the tongue below and the roof above, surrounded in front and on the sides by the teeth. 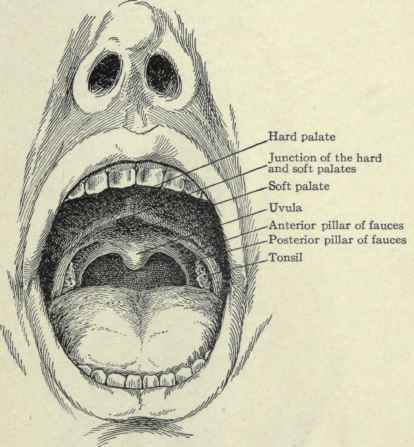 On each side are the inner surfaces of the cheeks and posteriorly are seen the uvula, the arches of the palate, and the pharynx. On the mucous membrane of the cheek, opposite the second upper molar tooth, is a small papilla in the top of which opens the duct of the parotid gland. A small probe can be inserted into it and passed outward and backward toward the gland. Fig. 133. - Interior of the mouth. The tongue is covered with a mucous membrane which is modified skin; therefore it is subject to the same diseases as the skin. It is covered with papillae of three kinds - the filiform, fungiform, and circumvallate. The filiform are the smallest and most numerous and form a sort of ground-work in which the others are imbedded. The fungiform are larger and fewer in number and are scattered on the dorsum, sides, and tip of the tongue among the filiform. The circumvallate, seven to twelve in number, form a V-shaped row at the base of the tongue. In the eruptive fevers, particularly scarlet fever, the tongue gets very red and the papillae become enlarged, forming what is known as the strawberry or raspberry tongue. Just beyond the apex of the circumvallate papillae in the median line is the foramen caecum. It is sometimes patulous for a short distance and is the upper extremity of the remains of the thyroglossal duct. On the posterior portion of the tongue behind the circumvallate papillae, on each side of the median line, is a mass of adenoid tissue which forms what is known as the Ungual tonsil. It sometimes becomes hypertrophied and is then cut off with a specially curved tonsillotome just as is done with enlarged faucial tonsils. Running from the base of the tongue to the epiglottis are three folds, called the median and lateral glosso-epiglottic folds. In the middle of the dorsum of the tongue is a furrow; this is caused by the septum binding the middle of the tongue down and allowing the muscles to rise on each side. On turning the tip of the tongue up (Fig. 135), a fold of membrane, the fraenum, is seen extending from the under surface to the floor of the mouth beneath. In newborn children, this fraenum appears sometimes to be too short, hence the name tongue-tie. In cutting it, the split end of a grooved director is placed over the fraenum and the tongue pushed back. This makes the fraenum tense and it can readily be snipped with the scissors. Care should be taken not to cut too deeply, or the ranine artery may be cut and cause troublesome bleeding. Running across the floor of the mouth, between the teeth and tongue, parallel to the alveolus, is the sublingual ridge, formed by the sublingual gland. This gland lies on the mylohyoid muscle beneath and the lower jaw in front. 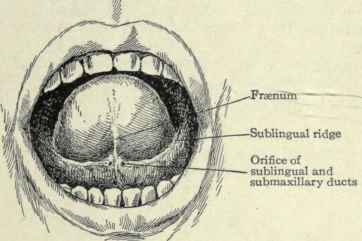 On each side of the fraenum on the sublingual ridge is a papilla into which the duct of the submaxillary gland, Wharton"s duct, opens. 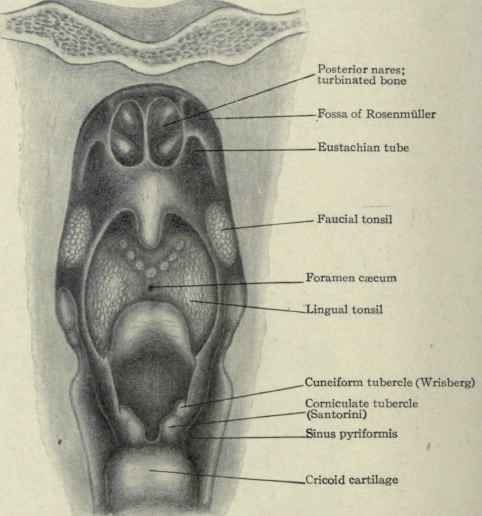 Opening into Wharton's duct, or by a separate duct into the same papilla, is the duct of the sublingual gland, called the duct of Rivinus or Bartholin. The superficial portion of the gland opens on the sublingual ridge to the outer side of the papilla by a number of small ducts, called the ducts of Walther. Fig. 134. 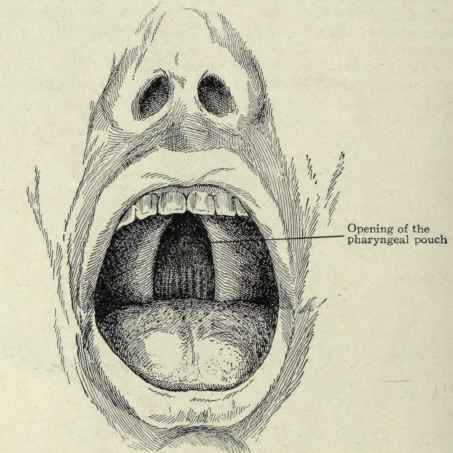 - View of pharynx, looking forward; posterior wall removed, showing the posterior nares, base of tongue, and opening of the larynx. Ranula is the name given to a cyst occurring in connection with the salivary glands. Such cysts involving the parotid gland are quite rare, so that the term is usually restricted to those of the submaxillary and sublingual glands. The mylohyoid muscle forms the floor of the mouth and these cysts lie on it beneath the tongue and between the tongue and the gums (Fig. 136). If the cyst is large it causes a protrusion or swelling beneath the jaw. The bulk of the submaxillary gland lies on the side of the mylohyoid muscle nearest the skin; only a small portion of it winds around the posterior edge of the muscle. 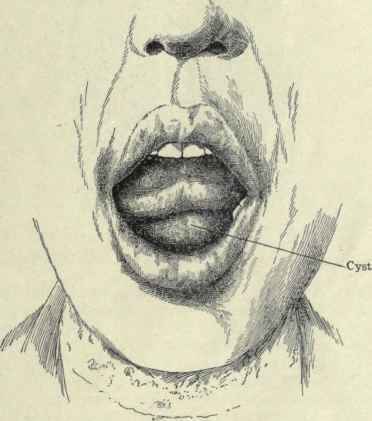 Therefore, cysts involving the substance of the gland would show in the submaxillary region of one side. If, however, the duct were obstructed (as by a calculus) it would form a cyst, which would bulge into the mouth beneath the tongue and be called a ranula. The sublingual gland is usually the starting point of these cysts, and it will be seen that as they enlarge they push the ranine artery with the tongue backward and are only covered by the mucous membrane. On this account there is little or no danger in operating on them. They are either dissected out or the front wall of the cyst cut away and the interior cauterized or packed with gauze to promote the formation of granulations. The jaw-bone is in front of them and the mylohyoid muscle beneath. Posteriorly lies the duct of the submaxillary gland and the ranine artery. Fig. 135. - Under surface of tongue and floor of mouth. Fig. 136. - Sublingual cyst (ranula). (From a photograph by Dr. Ashhurst). Mucous cysts can occur from the mucous glands of the mouth and tongue itself. There is a gland on the under side of the tip of the tongue, usually larger than the others, called the anterior lingual gland or gland of Nuhn. As a rule, these mucous cysts are small and are felt as hard rounded bodies beneath the mucous membrane. Dermoid cysts occur in connection with the tongue but very rarely. Carcinoma of the tongue is a moderately frequent disease and as the tongue is covered by modified skin, the cancer is of epithelial type. It begins on the surface of the tongue either by a change in the epithelial covering or else in fissures or ulcers at its edges. 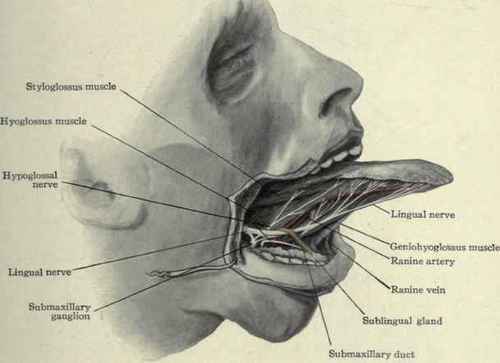 The lymphatics of the tongue pass to the submaxillary nodes beneath the jaw and thence to the deep cervical nodes along the great vessels or directly to the latter without passing through the submaxillary nodes. If the disease exists for any length of time, these are the nodes that become infected. They are only to be reached by an incision in the neck. The arteries of the tongue are the lingual and its branches, the hyoid, the dorsalis linguae, sublingual, and ranine. In removing the tongue, the lingual artery on the side to be removed is sometimes ligated in the neck; this cuts off the blood supply to that side and there is practically no bleeding. There is very little anastomosis between the vessels of the two sides of the tongue. The arteries run lengthwise through the tongue, so that in glossitis or inflammatory swelling of the tongue, incisions should always be made longitudinally into it. Fig. 137. - Under surface of the tongue, mucous membrane removed. The ligation of the lingual artery will be found described in the section on the neck. As the lingual artery passes above the hyoid bone, it gives off its first branch, the hyoid. It is quite small and goes above the hyoid bone superficial to the hyo-glossus muscle. The lingual then goes beneath the hyoglossus muscle and near the posterior edge gives off its second branch or dorsalis linguae. In excision, the tongue is usually cut through on the distal side of the dorsalis linguae artery. When this is the case, the bleeding which occurs from the branches of the dorsalis linguae is not marked because it is not a large artery. In order to draw the tongue out, it must be loosened posteriorly by cutting the anterior pillars of the fauces and palatoglossus muscle, and anteriorly at the fraenum by cutting the geniohyoglossus muscle. 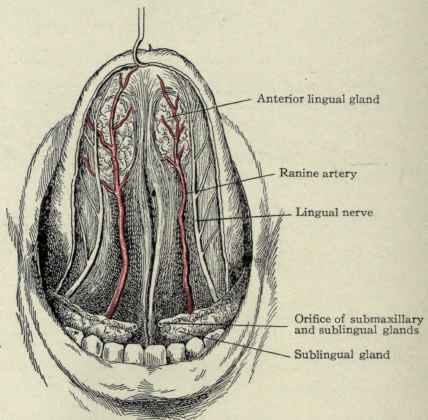 By drawing the tongue up, the ranine artery is drawn out of the way and there will be only slight bleeding from small branches of the sublingual, which comes from the main trunk at the anterior edge of the hyo-glossus muscle. From this point forward to the tip, the lingual artery is called the ranine. 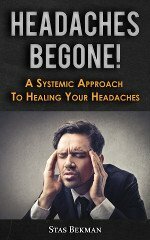 The tongue having been loosened and pulled out, Mr. Jacobson makes a transverse cut through the mucous membrane behind the growth and then, by pushing the tissues aside with a blunt instrument, exposes the lingual nerve and artery lying together beneath the mucous membrane. The artery is then tied and the growth removed. In order to secure any bleeding points after the tongue has been cut away, the floor of the mouth can be raised and pushed forward by the fingers beneath the chin. Fig. 138. - The cheek has been split, the tongue drawn forward, and the mucous membrane removed from its under surface, exposing the ranine artery and vein, the lingual and hypoglossal nerves, the sublingual gland, the submaxillary ganglion, and the duct of the submaxillary gland. This brings the stump into view and within reach. If lymphatic nodes are to be removed, they must be sought for by an additional incision on the outside beneath the jaw. The roof of the mouth is formed by the hard palate and the soft palate; the former comprising about three-fourths and the latter one-fourth. The hard or bony palate is composed in its anterior two-thirds of the palatal processes of the superior maxillary bones, and in its posterior third of the palatal bones. In the median line close to the incisor tooth, in the dried skull, is the anterior or nasopalatine foramen. This is subdivided into four foramina, two lateral and two anteroposterior. The former, called the foramina of Stenson, transmit the terminal branches of the descending palatine arteries; of the latter, called the foramina of Scarpa, the anterior one transmits the left nasopalatine nerve, and the posterior one the right nasopalatine nerve. The soft tissues of the roof of the mouth are thicker than they appear to be, so that when they are raised, as in operating for cleft palate, they form quite a thick layer. Infection of the roof of the mouth when it occurs is usually by extension from neighboring diseased teeth, abscesses being sometimes produced. The blood supply of the roof is of importance in relation to the operation for cleft palate (staphylorrhaphy) (Fig. 139). 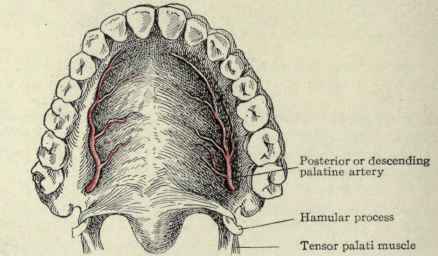 The blood comes anteriorly from the nasopalatine arteries and posteriorly from the descending palatine arteries, which come down through the pterygopalatine canal from the internal maxillary artery and make their appearance on the hard palate at the posterior palatine foramen. This foramen is on the roof of the mouth opposite the last molar tooth and 0.5 cm. to the inner side and in front of the hamular process (Fig. 140). This hamular process can be felt just posterior and to the inner side of the last molar tooth. If, in operating for cleft palate, the tissues are loosened from the bone too close to the hamular process, this artery may be torn near its exit from the foramen, in which case the bleeding is very free. To control it, the canal can be plugged with a slip of gauze. In detaching the soft palate from the posterior edge of the hard palate, it should be remembered that this attachment is quite strong. Not only are the muscles of the soft palate themselves attached to the bone, but the pharyngeal aponeurosis which lies under the mucous membrane on the posterior or upper surface of the soft palate is also attached to the bone. Fig. 139. - Cleft palate, showing the opening of the pharyngeal pouch on the posterior wall. Fig. 140. - Roof of the mouth, mucous membrane removed.